When we were children we were forbidden to touch the bundle of letters kept in a trunk in our parent’s room. We knew, vaguely, that our parents wrote them to each other before they were married. Many decades later, we realized that part of western Canada’s history was tied with pink ribbon and stored in that old trunk. We never thought to ask how, long before the Internet, a woman, born on her family’s farm near Beausejour, Manitoba, and working in Winnipeg, came to correspond with a bachelor, born on his family’s farm near Napanee, Ontario – a man who took up a homestead in the wilds of British Columbia. Country Guide, The Family Herald and Weekly Star, and The Winnipeg Free Press and Weekly Farmer. The Family Herald began publishing in 1869. 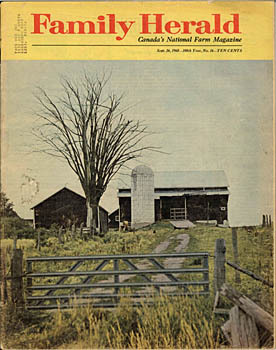 Its final edition was Sept. 26,1968. The Winnipeg Free Press, the oldest newspaper in western Canada, began publishing in 1872 and is still in print, as is the Country Guide. Naturally these papers focused on agricultural topics. Veterinary medicine, Young Farmer’s groups, fairs, and .land management were covered in full. A summary of news of the week, sports, household hints from nutrition to needlework, and cartoons gave farm families information about a wider world. Novels and short stories written by some of Canada’s best authors were serialized in each issue. The part which most affected our family was the section asking for pen pals. We don’t know which paper published our parent’s original request. I recall Mother mentioning “The Home Loving Hearts” page, and I believe it was in the Winnipeg Free Press. We don’t even know who first wrote to the paper asking for a pen pal. I suspect it was the bachelor in British Columbia. Lonely winter evenings in a log cabin below the Premier Range give a man lots of time to compose meaningful letters by the light of a coal oil lamp, whereas the bright lights of Winnipeg would be exciting to a Beausejour girl. December 1938, to marry Mother. They stayed with her family a few days, before boarding the train to Ontario to meet his family. “I’ll be bringing Anne home with me.” Father had written to his mother. He was a long time bachelor, well known as a practical joker so they didn’t believe him. Once they recovered from their surprise, they took her to their hearts. How could people who didn’t actually know each other, except by letter, marry? Many decades later, when both our parents were dead, our sister, who’d moved back into the family home, found some of their letters. There were only a few, all from our Father. The old prohibition against reading their private correspondence held. It took a long time before we overcame it and read them. Well, based on those letters, I’d have moved to the mountains myself. Romance,- they both commented on the same full moon -, mingled with reports of selling berries, trading garden produce for merchandise at Mr. Woodley’s general store at Red Pass. He assured her that heavier farming was simplified because the garden spot close to Swift Creek had a very high water table. Packing water, if necessary, would be easy from the river nearby. Comforting words for a woman accustomed to prairie dry land farming. “Visitors came today to look at the garden!”” he noted proudly. He didn’t pretend there were no problems, noting an unseasonable frost in July. “Lots of smoke today.”, he wrote that same month. Residents enduring wild fires in that valley today would sympathize. It wasn’t all about agriculture. We had no idea he had such love for wild plants and places till we read his letters telling the prairie girl about mountain lilies, “False Solomon’s Seal, is their Latin name” , describing their perfumed beauty, planning mountain trips so she could see the mosses, ferns and flowers of the high country. George Hicks- homesteader, gardener, prospector. In today’s speedy world, when we’re disappointed if our e-mails don’t elicit an almost instant response, we forget how important a real letter was. They both knew to the day how long a letter mailed in Winnipeg would take, traveling by train, sorted in the mail cars, to reach Valemount, B. C. When a man walked two miles to the post office, he was disappointed if a letter wasn’t waiting for him. And he wrote to her about that disappointment. Once he berated himself because he hadn’t thought her letter would have come so soon, he didn’t go for the mail and ‘lost two days of happiness’ reading and re-reading it. After their honeymoon trip East, they returned to the homestead where they cleared more land, set up an elaborate irrigation system for the bigger garden, sold produce, hunted, participated in the growing community, built a much larger log house, and raised four children. Before we children arrived, our parents climbed and hiked the mountains. They dug up some of those mountain lilies and transplanted them behind their first cabin where they thrive to this day. They gave all of their children an undying love of the high country and wild places. (Along with a practical knowledge of what’s a weed and what’s a plant which will never leave us.) One of the last stories our Mother told was of a hiking trip where she and Father camped in the alpine on a moonlight night and admired the rivers running molten silver in the valleys below. It would never have happened without that farm paper’s pen-pal page.